Many things in life are temporary by nature. Fresh food spoils, newspapers become irrelevant, and cardboard boxes weaken with use. For these things, we do our best to take only what we need, and to recycle them into the best possible second life. But other things were meant to last. What do we do when one of those things breaks? Too often, they’re thrown out with the trash or the recycling waste. New things replace them, packaged in plastic and shipped from overseas. But what of our old things? Could they be repaired or re-purposed? Could they be given a second chance to fulfill their potential? Many times they can be, and it’s easier than you might think! Growing plants from seed is such a hopeful, optimistic thing. Every year, when I see my first pair of cotyledons, I envision their potential so intensely that I can almost taste the summer’s garden. Of course, those baby seedlings have a long journey ahead before harvest day comes. They will battle weather, insects, disease, and hungry herbivores. If they win all of those battles, only then will I taste the sun-warmed, juicy potential I see in my day-old seedlings. My first year of gardening, I tried to make plant labels out of popsicle sticks. At first, it worked well. But as the weeks went by, water caused the wood to swell and the ink smeared beyond recognition. I ended up with about a hundred unmarked plants! I could of course discern the peppers from the broccoli, but I never did sort out all the varieties of tomatoes I had planted. The next year I purchased plastic plant markers. They were expensive, but I thought at least I would be able to reuse them. However, the summer sun baked the plastic until it became weak and brittle, and their broken pieces will probably haunt the local landfill for centuries to come. Finally I came across this technique of cutting labels out of empty soda cans. The writing is etched into the metal, so it’s completely permanent. They are reusable, they can be cleaned in a dishwasher, and ultimately recycled when the garden has no more use for them. I cut fancy shapes, engraved with decorative designs for my perennials. 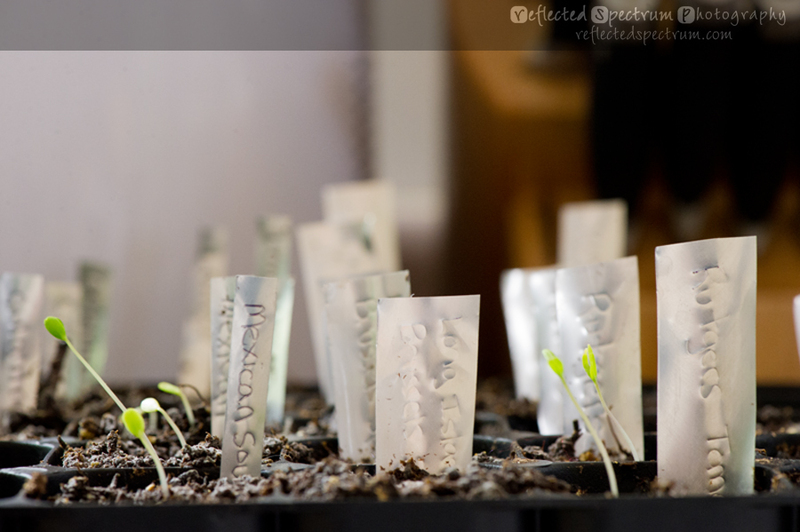 When I’m starting dozens (or hundreds) of seeds, I love to make simple rectangular labels. The creative and useful possibilities are endless! Best of all this project is: FREE! ECO-FRIENDLY! CRAFTY! and PRACTICAL! A set of beautifully embellished aluminum plant markers could even make a great gift idea for gardeners.